Asters are the delightful daisies of autumn, tumbling forth with a profusion of tightly packed flowers that mask all foliage underneath. These purple-pink blooms have been tongue-twistingly reclassified as symphyotrichum. Fans of the flower still call them by their old name, or more commonly Michaelmas daisies, but it’s handy to know in case it says it on the garden centre label. A classic combination is to plant asters in among fiery yellow perennials, such as rudbeckia, heleniums or golden sprays of solidago, to set off the colours. Planted alone they are wonderful, but they’re especially magnificent with contrasting planting partners. Asters have a long history in this country, and were bred extensively in the early 20th Century as a vibrant cottage garden stalwart, lighting up the darker days of autumn. 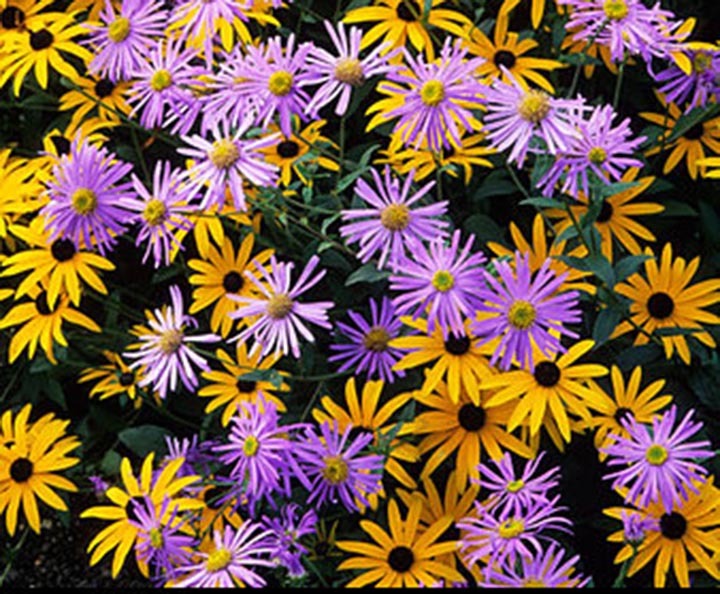 Try ‘Mönch’ or ‘Little Carlow’ for masses of cheerful happy daisy faces in lilac. Their prime time is September and October, but Aster trinervius harae will bloom from late October with dark violet flower heads and zingy yellow centres. In a good year it will be with you until Christmas. Buy some beautiful plants now for borders or pots, or try your hand at sowing them in spring and summer next year. Two things to remember are to sow the seeds and leave them uncovered as they’re so fine and to place them in a warm propagator. Plant them out next spring so they can get established in the warm soil. They make really wonderful cut flowers, too – just imagine, on a freezing autumn day, being able to snip a few bright and breezy aster stems for the kitchen. Should you be in Herefordshire this autumn, be sure to pop in to the Picton Garden in Colwall, home of the National Collection of Autumn-flowering asters. The well-stocked nursery alongside it is actually the birthplace of the modern aster, where specialist Ernest Ballard created many of the wonderful varieties we know and love today. The garden’s borders are at their peak, awash with seas of every variety imaginable, planted among unusual shrubs, ferns, bamboos and acers to give an eye-catching insight into how we can all bring a little vibrancy to our gardens this time of year. Remove old bedding and make way for new plants, such as autumn and winter heathers. Or simply clean the pots and pack them away. Trim back summer flowering perennials and pack away their supports. Leave a few attractive seedheads, such as phlomis, for structure. Empty your greenhouse of old foliage, plants and rubbish before giving it a clean with hot, soapy water to keep diseases at bay.